Want to know more about "the Mormons"? Or, more properly, members of The Church of Jesus Christ of Latter-day Saints? (It's not "the Mormon Church" - that's a misleading nickname.) Want to know what we really believe and do? Perhaps I can help. This page is the attempt of Jeff Lindsay, a Latter-day Saint in Shanghai, China, to explain who we are and what we believe. I'm a student of LDS topics, a returned missionary, father of four, BYU alumnus, and something of a geek-- all the qualifications you could hope for, frankly, at least on the Internet. Though I strive to be accurate and fair, this page is subject to all the errors mortals make and is solely my responsibility. It has not been approved by the Church, by BYU, or even by Mitt Romney. Sorry! For other information, be sure to visit LDS.org and Mormon.org - but even these Church-owned sites have mortal Webmasters and authors. Why do we call ourselves "Latter-day Saints"? What about all the awful things people say about Mormons? What about Mitt Romney? Is he a representative Mormon? Is this just an American religion? You may wish to look at my list of related LDS pages. And before you fire off a long list of questions or accusations, be sure to check my LDS FAQ site. Many common sincere questions and nasty allegations are treated there. Also see FairMormon.org and the many resources at the Maxwell Institute (originally FARMS), such as Latter-day Saint Christianity: Ten Basic Issues, an excellent online booklet that deals with some common questions and controversies about Latter-day Saint beliefs. Also see The Mormon Interpreter for interesting information from scholars that might be of interest to some readers seeking to better understand our faith and our scriptures. A basic introduction to "the Mormons"
The Church of Jesus Christ of Latter-day Saints is a Christian church (though some critics deny even that basic claim) founded in 1830 in the state of New York in the United States. It was founded by Joseph Smith, Jr., who we view as a prophet of God. The account of his call as a prophet and the divine work of the Restoration of the Church of Jesus Christ is given in The Prophet Joseph Smith's Testimony. "The fundamental principles of our religion," according to Joseph Smith, "are the testimony of the Apostles and Prophets, concerning Jesus Christ, that He died, was buried, and rose again the third day, and ascended into heaven; and all other things which pertain to our religion are only appendages to it" ( Teachings of the Prophet Joseph Smith , p. 121). "We solemnly affirm that The Church of Jesus Christ of Latter-day Saints is in fact a restoration of the Church established by the Son of God...; that it carries His sacred name, even the name of Jesus Christ; that it is built upon a foundation of apostles and prophets, He being the chief cornerstone; that its priesthood ... was restored under the hands of those who held it anciently...."
In the LDS view, it was through the Prophet Joseph Smith that the Lord restored the original Church of Jesus Christ, including divine priesthood authority, divinely called apostles and prophets, and the pure covenants and ordinances (baptism by immersion and the gift of the Holy Ghost by the laying on of hands, for example) that are part of the fullness of the Gospel of Christ. Since the assassination of Joseph Smith by a mob in 1844, stirred up by some of the rather intolerant religious leaders of that day, the Church has continued to be led by divinely called leaders. We believe that each of these Presidents of the Church have been called as prophets and apostles of God. Not perfect, not infallible, but authorized leaders of the Church with the ability to receive revelation for the Church, when the Lord so desires. Headquarters of this worldwide church are in Salt Lake City, Utah, where early members of the Church settled after being driven out of the eastern and Midwestern states by violent mobs. The Church is currently led by President Thomas S, Monson, who took the place of President Gordon B. Hinckley when he passed away on Jan. 27, 2008. President Hinckley was internationally known, respected, and loved by millions as a true example of follower of Jesus Christ. President Thomas S. Monson brings a similar stature and reputation to his role as the leader of the Church, with two counselors in a First Presidency, assisted by a Quorum of Twelve Apostles. Current membership is approximately 14 million, with hundreds of thousands of new members joining each year in many parts of the world. The Church is not just a Utah church--in fact, Utah members make up a small minority (less than 20%) of total Church population. As of February 1996, over half of the members live outside the United States. Large numbers are found in Mexico, Central America, South America, and the Pacific Islands. Strong growth is now occurring in Africa. Strong congregations are also found throughout Europe. Growth is also underway in several parts of Asia. Missionary work is an important factor in our growth. As a member of the Church, I honestly believe that we have something wonderful and divine that can bless the lives of all people who choose to accept the Gospel of Jesus Christ. The Church helps families be stronger and happier. It helps individuals find peace and meaning in life. It helps all of us in learning who we are and how we can live to have greater joy and purpose. It helps us find answers to some of the most important questions of life. We have many beautiful truths to share, but please note that we do not have a monopoly on truth. We recognize that there is truth and goodness in virtually all religions, and many things that we can learn from the truths, wisdom, and experiences of those in other faiths. We do not have all the answers! In fact, one of our "Articles of Faith" teaches us that we believe that there are yet many great things to be revealed--meaning, of course, that there is plenty that we don't know yet. We are commanded to keep learning, to seek knowledge out of "the best books" and to learn as much as we can. At the same time, we believe we have been given some precious truths and principles in the restored Gospel of Jesus Christ. We believe that the Church is of divine origin, in spite of all the flaws of its human members and human leaders over the years. And we think what we have can be added to the truths you may already know and cherish to bless your life in many ways and bring you close to our Heavenly Father and His Son, Jesus Christ. Come take a look! Latter-day Saints believe in Christ as the Savior, the Redeemer, the Son of God, the Creator of the earth, and the only source of salvation. It is His love and grace that give meaning to life and hope to humanity. We believe in the Bible, which plainly teaches that Christ is our Savior and that all men must repent and come unto Christ to be saved. Some critics proclaim that Mormons are not Christians and don't believe in Christ. I really don't like other people telling me what I believe! 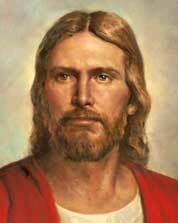 As a Latter-day Saint, I have been taught, and have personally chosen, to accept Christ as my Savior. I am taught to follow Him, to rely on His love, and to feast on His word. I know that real Mormons are Christians. We worship Christ and covenant to follow Him. We are baptized in His name to follow Him, we partake of the sacrament (the holy communion) weekly to remember the sacrifice of His blood and to remember His victory over death, we pray to the Father in His name, and we strive to obey Him, knowing that it is only through His merits and grace that we are saved. He is constantly held up in our meetings as our Savior, our Redeemer, our Lord, and the author of our faith and our salvation. We believe that He stands at the head of His living Church, leading it as in days of old through revelation to His prophets and apostles. The Christ we worship is the living Christ, the Son of God, foretold in the Old Testament, revealed in the New Testament, and affirmed in The Book of Mormon: Another Testament of Jesus Christ. 1) Commandment keeping? In Matthew 19:16-22, somebody asked Christ directly what he needed to do to have eternal life. Christ answered: "If thou wilt enter into life, keep the commandments." We believe Christ said this for a reason - and there are dozens of similar statements in the Bible (scripture-lovers may wish to study a sampling of such statements). This does not mean that we are saved by works, but that we must follow Christ to receive His grace. Gaining access to grace by following Christ is not saving ourselves by our works! We will be saved from physical death - thanks to the resurrection of Christ - by grace, regardless of what we do (1 Cor. 15:20-22). We also can be saved from spiritual death through the grace of Christ, thanks to His infinite atoning sacrifice. (Spiritual death = being cast out of God's presence because of sin, losing "eternal life" - the heavenly immortal life that is possible for those living in the presence of God.) But to receive that grace and forgiveness, we must repent of our sins (Matt. 4:17, Mark 6:12; Acts 2:37,38; Acts 17:30; Heb. 6:1-3), have faith in Him, follow Him and strive to keep His commandments (Matt. 7:21, Rom. 2:4-11), "relying wholly upon the merits of him who is mighty to save" (Book of Mormon, 2 Nephi 31:19). I know that many good Christians will disagree with my interpretation of scripture, but I hope they will still accept my sincere declaration that Latter-day Saints are Christians and are taught to have faith in Christ and to look to Him and His grace for salvation. The Biblical concepts of faith, grace, works, and salvation are discussed in detail on my Faith and Works page, which now includes a discussion of God's use of covenants and a review of Martin Luther's doctrine of justification by faith alone. 2) The Trinity? We believe in God, the Eternal Father, and in His Son, Jesus Christ, and in the Holy Ghost. We believe that they are One Eternal God--yet they are also three distinct Beings. The question is, how are they one? Most modern Christians accept creeds developed primarily in the fourth century that teach a Trinity of one substance and one Being, without body, parts, or passions, yet having three coequal persons. Many feel that the doctrine of the Trinity is exactly what the Bible teaches, but I see that doctrine as a departure from the teachings of the Bible due to the powerful influence of Greek philosophy, where God was taught to be immaterial and of one "substance." So what do the scriptures mean when they speak of Christ and the Father being one? Recall the great prayer of Christ in John 17. There, in verse 21, Christ prayed that His followers "all may be one; as thou, Father, art in me; that they also may be one in us." In verse 22, He again prayed "that they may be one, even as we are one." A related concept of oneness is also expressed by Paul in 1 Cor. 3: 6-8: "I have planted, Apollos watered; but God gave the increase.... Now he that planteth and he that watereth are one: and every man shall receive his own reward according to his own labour." In my view, this kind of oneness is a unity of purpose, intent, and heart, not a blending of substance into one being. When Christ prayed (many times) to His Father in Heaven, we believe that He was doing exactly that - communicating with His Father, another Being, of whom Christ said, "My Father is greater than I" (John 14:28), contradicting, for example, the Athanasian Creed. Likewise, In Acts 7:55,56, before being killed by hateful critics, Stephen looked up towards heaven "and saw the glory of God, and Jesus standing on the right hand of God." He saw two Beings. Further, in the creation story in Genesis 1, God (Elohim, a plural noun) says in verse 26: "Let us make man in our image, after our likeness." We feel inclined to take that literally. (Note that the same wording is used to describe the physical similarity between Adam and one of his sons in Genesis 5:1-3; see also Heb. 1:3 and James 3:9.) I know that goes against what most churches teach and is certainly open to debate, but taking the Bible too literally should not be sufficient cause to say we are not Christians. In contrast to the abstract and metaphysical formulations of human philosophy seeking to deal with God, look at the witness offered in such passages of the Bible as Luke chapter 24. In this chapter (verses 36-43), the resurrected Christ shows His body to His surprised disciples. They first think it is a spirit, but Christ asks them to feel His tangible body: "handle me and see, for a spirit hath not flesh and bones, as ye see me have." To drive the point home, He then asks for some food, and eats it in front of them. We actually believe that this happened and was a real event, not a dream or a metaphor. In contrast to my understanding of the standard Trinity doctrine (God "without body, parts, and passions"), we believe in a literal resurrection and believe that Christ is a resurrected Being with a tangible body, exactly as He showed us in Luke 24. We believe that Christ was "in the form of God" as Paul said in Philippians 2:6 and that we also are created in God's image and likeness, and that through the Atonement and Resurrection of Christ, we also may receive a glorious body like His, as Paul says in Philippians 3:21. Of course, you don't have to agree with us! Feel free to charge us with being overly literal. But please don't say that we aren't Christians if we don't interpret the Bible the way you do. 9 O remember, remember, my sons, the words which king Benjamin spake unto his people; yea, remember that there is no other way nor means whereby man can be saved, only through the atoning blood of Jesus Christ, who shall come; yea, remember that he cometh to redeem the world. These passages are typical of LDS teachings about Christ. Salvation is only through Him. You may also wish to read 3 Nephi 11 from the Book of Mormon. Members of the Church are properly called "Latter-day Saints," not because we think we are better than anyone else (that can be easily refuted!) but because we follow the New Testament convention in which the early followers of Christ were called Saints (see Acts 9:13,32,41; Rom. 1:7; 1 Cor. 1:2; Philip. 1:1). The term "saints" is translated from a Greek term meaning "holy" and reflects the call in Christianity for people to follow Christ (though we are obviously imperfect and quite hopeless without the grace of Christ!). 1 Peter 1:14-16, for example, urges us to become holy, for God is holy - and we should follow Him. I see the term "saint" as reflecting a hope in Christ, a decision to choose the sacred over the profane, a belief that through Christ we may ultimately become pure and become "partakers of the divine nature" (2 Peter 1:4). In short, members of the original Church called themselves saints. Members of the Church restored in the "latter-days" (the last major era - of unknown length - before the Second Coming of Christ) likewise call themselves "Latter-day Saints." The name is not the important thing, of course. What really matters is that Latter-day Saints are Christians, seeking to follow Christ and live His teachings. Though we feel it is essential to follow Him and obey Him, our obedience does not save us or remove our sins. It is only through His grace and His infinite Atonement that we can have joy in this life and the hope of eternal life in the world to come. 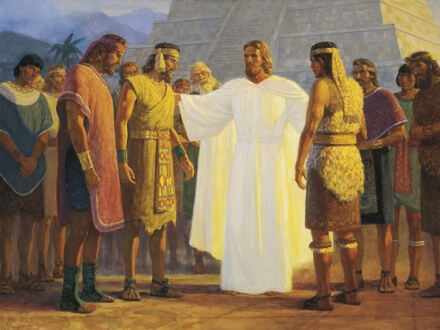 The highlight of the Book of Mormon is the ministry of the Resurrected Lord Jesus Christ to the Book of Mormon peoples in the New World after His Ascension in Jerusalem. This painting with its appropriate Mesoamerican architecture is available in the Book of Mormon media collection at LDS.org, including a high-resolution version for printing. Most people do not know us as "Latter-day Saints," but as "Mormons," a nickname originally applied by enemies of the Church who mocked our belief in the Book of Mormon. While we accept the Bible as the word of God - as long as it is translated correctly--we also prize as sacred scripture The Book of Mormon: Another Testament of Jesus Christ. This sacred text is a record of God's dealing with ancient inhabitants of this (the American) continent, just as the Bible is a record of His dealings with a group of people in the Middle East. Both volumes attest to the divine status of Christ as our Savior and as the Son of God who atoned for our sins and brought to pass the resurrection. The "Mormon" of the Book of Mormon was the primary editor of the ancient text. He was a prophet of God who lived around 400 A.D. in the New World (most likely in Mesoamerica, according to LDS scholars examining the geography and cultural setting of the text). Feel free to use the image, by the way. Many LDS people prefer to be called "Latter-day Saints" rather than Mormons, though we are usually just fine with the term "Mormon" after all these years, and we sometimes use it ourselves. However, many of us may be disappointed when people call the Church "the Mormon Church." That's not the name at all. Since there are some folks out there who spend a lot of time trying to tell people we don't even believe in Jesus Christ, changing the name of our Church to the nickname of "Mormon" plays into their hands. So remember that it's The Church of Jesus Christ of Latter-day Saints, never the Mormon Church, but personally I don't mind if you call us "Mormons" as long as you're at least trying to be polite. Among the many prophets to whom God spoke anciently, there were some in the New World who were descendants from the House of Israel and who knew of the prophesied ministry of the Messiah in Israel. The Book of Mormon is a record written by such prophets, covering (with one more ancient exception) a time span of 600 B.C. to 400 A.D. The Book of Mormon, like the Bible, contains a record of God's dealings with a part of the House of Israel. It contains prophecies regarding Christ and also reveals how Christ, after His resurrection and ascension, later ministered to those who had waited for Him in the New World. The Book of Mormon was anciently abridged by a prophet named Mormon and was engraved on gold plates, to preserve the sacred writings for a future time. Joseph Smith received the divine commission to translate the gold plates through the power of God. The translation was published in 1830 as a volume of scripture, a sacred record. If he were a fraud, the Book of Mormon would be a ridiculous forgery, a silly 500-page witness to the stupidity of the unlearned Joseph Smith. The Book of Mormon is offered as the most tangible and easiest test of the mission of Joseph Smith: he was either a forger and a con-man of the worst degree, or a prophet of God. The Church has no foundation at all if the Book of Mormon is anything other than an authentic ancient document and the word of God. So how does the Church and its membership view the Book of Mormon after 165 years of critical examination? Do we apologize for it, speak of it as metaphorical, ignore it as an embarrassment? No. More boldly than ever, we invite the world to put it to the test - to examine it, to dig into it, to treat it seriously. We - and I - solemnly proclaim that it is the word of God, that it can and should be held up for meticulous inspection - linguistically, historically, culturally, theologically, anthropologically, etc., but most importantly, through the power of prayer and inspiration from God as the ultimate test of its veracity. It is because of my personal knowledge that the Book of Mormon is true that I am a member of this Church. If that book is true, then so is the Bible, then so was the claimed restoration of the Gospel through Joseph Smith, then so is the principle of restored priesthood authority and of modern, living prophets. The Book of Mormon is the keystone of our religion. 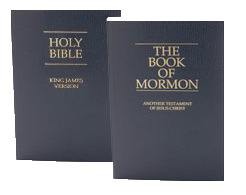 Let me also offer my opinion that the Book of Mormon is outstanding literature, packed with the complexity of real life, ancient poetical forms, adventure, politics, history, theology, cultural information, symbolism, irony, tragedy, containing powerful descriptions the rise and fall of two major civilizations with insights and warnings that ring true for our world today. It was written by ancients who saw and knew our day, so it has been "personalized" - largely through the inspired editing of the ancient prophet-historian, Mormon, in 400 A.D. - for us. And it's not what you expect! For more detailed information on the Book of Mormon, see my Book of Mormon Introduction page. Call 1-877-537-0003 to receive a free Book of Mormon or order a free copy at Mormon.org. You can also access the text of the Book of Mormon online at LDS Scriptures Online at LDS.org. Many questions are asked about the Book of Mormon, including questions about Book of Mormon evidences, changes in the text, alleged problems in the text, etc. I've dealt with many of them on my LDS FAQ page. Feel free to inquire. It's a book that can be examined carefully, critically, and thoroughly. In fact, it begs for that kind of scrutiny. After 150 years of attacks, it stands truer than ever, a bright and powerful witness of Christ and a confirmation of the truth in the Bible. The power and divinity of the Book of Mormon is why I'm a member of this Church. Please, read it before you condemn. People who know the Latter-day Saints often have quite complimentary things to say (at least when they aren't talking about their political opponents and ex-spouses). Though we have plenty of room for improvement, LDS people generally make good neighbors, good citizens, good employees, and good Christians, in spite of our doctrinal differences with other groups. We try to live the Gospel of Jesus Christ and that is reflected in much that we do - the way we raise our families, pursue education and careers, live our moral and health codes, participate in our communities, and serve our fellow beings. We've got problems, to be sure, but we're trying. In spite of that, there are and have long been critics who say genuinely terrible things about the Latter-day Saints. Why? Today we are generally treated kindly, but the flames of hate still burn in some hearts, leading to rivers of misinformation and frightening denunciations of our beliefs and our motives. A vocal minority of ministers even tell their flocks that we are not Christian and that we are a threat to be feared. Others claim they are acting in the spirit of Christian love as they mock our doctrines and turn to ugly rumors and outright lies to smear the Church. Given the adverse effect such attacks have had on many people, I cannot remain silent. In several of my Web pages, I seek to answer some common questions about the Church. Many of these answers are in my suite of "Mormon Answers to Frequently Asked Questions (LDSFAQ)." For example, some questions about Joseph Smith and the LDS/Biblical concept of prophets are answered on my Prophets page, while another page treats questions about various accounts of Joseph Smith's First Vision. Also see "Historical or Hysterical -- Anti-Mormons and Documentary Sources" by Matthew B. Brown for an informative and entertaining essay. Common attacks about the LDS view of our divine potential as children of God and our relationship to God are also considered. I have a lot on the Book of Mormon as well, including the recent DNA controversy. For serious students of LDS topics, some of my most extensive pages deal with the genuinely deceptive attacks made against the tiny but significant Book of Abraham (including the surprising evidence from ancient records that supports the Book of Abraham) and the charges that the LDS Temple is derived from Masonry. I have examined many such anti-LDS allegations and find them to be dishonest and malicious in many cases, simply wrong or misguided in others, and actually worthy of further study and inquiry in a few other instances. No, we don't have all the answers - but the ones we have are worth thinking about. Naturally, any system of religious belief seems odd to those who don't share the same views. The Christian Eucharist (communion or, in common LDS terminology, simply "the sacrament") is sacred and uplifting to those who understand it, but in the hands of caustic critics, it has been characterized as a grotesque and bloodthirsty act of ritual cannibalism. Ugh! Such twisted misrepresentations are the basis of many "professional" anti-Mormon works. I say professional because, sadly, there are people who make their livings mocking the religious beliefs of Latter-day Saints. I'm all for open discussion and honest exploration, but the tactics used by a few critics go far beyond honest criticism and discussion. Some popular and lucrative videos and books now charge that we worship Satan, that the Church is plotting to take over the United States, that we mock Christ, and worship numerous false gods, including "extraterrestrial aliens." LDS people are genuinely shocked to hear such claims. I think some of these extreme critics just "innocently" repeat all the slander that they've heard from others but other anti-LDS authors and video producers must surely know that their claims are deceitful and false. Sometimes I wonder what possesses these people. Find out for yourself what we really believe. Read the Book of Mormon, visit a sacrament meeting at a local church, talk with some LDS people, read our monthly Ensign magazine (there's also an Ensign app). We don't worship Adam or Satan or even the Green Bay Packers (Wisconsin Mormons excluded, of course)--we worship God the Father who gives us grace, hope, and life through His Son Jesus Christ. We don't have orgies in our temples, we have no secret child sacrifices anywhere, we haven't tapped your phone line, we aren't organizing militias to help us take over the country, and we aren't trying to put mind-control drugs in your toothpaste (but do check your shampoo carefully!). Please, look past the elaborate attacks and seek to understand, not just to ridicule. You may freely disagree, but let's at least disagree about what we really believe, not about what "The God Makers" or some other deceitful source claims we believe. Mitt Romney is one of the more famous Mormons right now, but there are many Mormons of all political stripes. No one Mormon can be called "representative" of the diverse mix of people within the Church, but he does appear to be an active, faithful Latter-day Saint with a strong LDS heritage. He has served in some common LDS callings and seems to be respected by many LDS folks. As for the relationship between his faith and his politics, that's a more difficult topic which I'll leave for other pundits to tackle. Some Mormons don't like his policies and some do. Some will vote for him and some won't. We aren't a monolithic block. Ask fellow Mormon Harry Reid if you have any doubts. Internationally, I find that people in many nations are confused by the relationship between religion and Romney. Some of my Taiwanese friends have heard that recent U.S. Presidential candidate Mitt Romney was a Mormon, but they have also heard the usual allegations that it's a "cult" or bizarre group. Well, if you don't believe in God, any religious belief may seem bizarre, and we certainly have our quirks. But whether you agree with Romney or not, there's a lot to like about the real Latter-day Saint faith and no reason to worry about who we are. Regardless of his political viewpoints, Mitt Romney does remind us that an active Mormon can be eloquent and capable of gaining enough respect in modern society to at least wage a serious campaign that resonates with many people. But you don't have to look to politics to find interesting Mormon examples like that. There are numerous Mormons who have earned the respect of many in numerous fields such as sports, science, business, and the arts. No one Mormon is "representative" of all of us, but the good that can be seen in many of these women and men is consistent with the values taught by the Church and found in various degrees in the lives of many who take their religion seriously. The Church teaches us that we are sons and daughters of God, here in mortality to learn good from evil and to prepare to return to God. Through the Atonement of Jesus Christ, it is possible for us to repent of our sins and be forgiven. We also strive to grow in our faith and to reach the divine potential that God has given each of us. Faith in Christ, repentance of sins, baptism by immersion for the forgiveness of sins, and the cleansing and guiding gift of the Holy Ghost are basic elements of the Gospel as we understand it. The elements are given strength through the divine authority of the Priesthood that God has put into His Church, which, though filled with mortals, is still a divine tool to guide us in our path back toward God and to give us the covenants and teachings that we need. An important part of our mortal journey is learning to live in the family unit. One revealed tool that the Lord has given us to help families is the program called Family Home Evening. President Gordon B. Hinckley spoke of this important concept in the Church in his March 2003 First Presidency message on Family Home Evening. Other basic information on the teachings of the Church are given in some of the links on this page, especially LDS.org. But as you search for information, make sure you understand the difference between true LDS doctrine and what our critics claim is LDS doctrine. Official, canonized LDS doctrine is found in the scriptures and in statements or proclamations of the First Presidency that have been presented to the Church for a sustaining vote. In addition, statements from the First Presidency and Quorum of the Twelve Apostles carry much weight, and recent General Conference sermons from leaders of the Church are useful and important sources of information from living prophets and apostles (though generally not canonized). But stray quotes from various leaders of the Church do not necessarily reflect official LDS doctrine. In fact, anti-Mormons love quoting sources they know have no bearing on true LDS doctrine, such as Orson Pratt's The Seer. And they labor relentlessly with the huge Journal of Discourses to find a stray (and possibly misquoted) statement from a nineteenth-century leader to cause consternation, not informing their audience that those quotes are not canonized, are not used to define LDS belief, and are frequently from spur-of-the-moment sermons recorded by hand by a third party with frequently questionable accuracy. Our critics need to get real - and get real doctrine - by relying upon canonized sources. I grow tired of anti-Mormons trying to tell me what I believe, when they are ridiculously far from the truth (for example, we do NOT worship Adam!!). As for unofficial sources, some can be useful, nonetheless. For example, there is my humble suite of "Frequently Asked Questions About Latter-day Saint Beliefs". This is based on my e-mail correspondence with numerous inquirers (and critics). I believe my answers reflect LDS doctrine accurately, but they are my own answers and not officially approved by the Church. Several key LDS doctrines are widely misunderstood outside the Church (and even by some inside the Church, if they fail to read the scriptures and listen carefully to the words of living prophets). For example, the Biblical relationship between faith, grace, and works, as understood in the Church, is a frequent source of unjustified criticism and an example (in my opinion) of how important Biblical truths have been restored in their plainness and purity. Some basic information about Church structure, temples, and the importance of families is provided in my unofficial selections from the LDS Press Book. The above proclamation represents actual LDS doctrine because it has been sanctioned and issued by the First Presidency of the Church, all through official channels. It is also available in other languages such as Chinese. To really understand the LDS view of the family, of salvation, and of life itself, it's important to know that we believe all men and women are spirit children of our Heavenly Father (Heb. 12:9), and that we lived with Him as spirits before we were born into this mortal world (Job 38:4-7; Jerem. 1:5; John 9:1; Eccl. 12:7; Acts 17:28; Eph. 1:4). Basic information on this topic is provided by Allen Leigh's article on our premortal existence. Additional information is provided in Barry Bickmore's essay, Mormonism and Early Christianity: The Nature of the Spirit World (archived). We enter mortality only once - we do not believe in reincarnation. We needed to be born here to receive a mortal body which could rise with us in the Resurrection to potentially become a glorified, immortal body like that of Christ (Phil. 3:21; John 5:28,29; 1 Cor. 15:20-22; Isaiah 26:19; Luke 24:36-43). This precious body also gives us the power to learn and do many things not possible as spirits, such as experiencing pleasure and pain, learning to control the flesh, raising a family, and so forth. When we were born, a veil of forgetfulness was placed over our minds so that we could not remember our existence as spirits with God, thus requiring us to walk by faith and allowing us to be tested, to show what we would choose when left to ourselves. Mortality, then, serves to give us the gift of a body while allowing us to be tried as free agents. One of the greatest gifts God gives us in this mortal world is free agency, the freedom to choose between good and evil on our own. This freedom comes with responsibility, for we will be judged by what we do and choose. Fortunately, through the Atonement of Christ, we can overcome our sins and be forgiven of them by His grace and return to His presence. For those that die in their infancy, not having reached the "age of accountability," the blessing of eternal life is assured through the Atonement of Christ. Only those who are morally accountable - i.e., capable of sin - have need for repentance and baptism. All others are redeemed through Christ. The age of accountability is typically taken to be 8 years, the age when baptism of children is first permitted. A well-known "Mormon" peculiarity is our health code that forbids the use of tobacco in any form (smoking or chewing) for humans and the drinking of alcoholic beverages, tea, or coffee, while encouraging a healthy lifestyle and a diet rich in grains, fruits and vegetables. Grains (including wheat in particular) are given special emphasis. Latter-day Saints are also counseled to "eat meat sparingly," though meat is not forbidden. This health code, provided by revelation to Joseph Smith in 1833, reads like the modern pronouncements of experts on nutrition and health - and was far from obvious to the world of the 1830s (or even the world of the 1950s). In fact, it is very similar to the "food pyramid" that the U.S. government recently developed after spending $900,000 in research. Hey, I would have gladly given the answer for half that amount! The revelation to Joseph Smith is known as the Word of Wisdom and is canonized as Section 89 of the Doctrine and Covenants. The text does not explicitly name coffee and tea but forbids "hot drinks", which were essentially limited to coffee and tea in Joseph Smith's time. Joseph Smith is quoted as saying it referred to tea and coffee, and the Church later officially interpreted that passage to refer to coffee and tea. The LDS health code and other inspired LDS teachings give faithful Latter-day Saints a healthy and happy way of life. Latter-day Saints believe that the original Church of Jesus Christ had to be restored by Christ - not just reformed by men. In our view, the reason why a restoration was needed (Acts 3:19) is that a falling away, or apostasy, had occurred (2 Thess. 2:1-3) in which priesthood authority, prophets and apostles, and many important truths had been lost from the original Church. This view is not a good way to win popularity contests, of course, since it implies that something is wrong with the various other churches in the world. This does not mean that other Christians and Christian churches are evil, but they may be said to be incomplete without the fullness of the Gospel which has been restored. We reject parts of the popular creeds that were hammered out by men long after the time of the apostles, but we respect our fellow Christians and recognize that many of them have accepted Christ and strive to follow the teachings of Christ. We are not "better" than them, but we have something precious to share. We hope that our fellow Christians - and all people - might welcome the sacred record of Christ's dealings with "other sheep" (John 10:16) in the Americas, as recorded in the Book of Mormon; we hope that they might accept an authorized baptism into the organization that Christ has personally restored; and we hope that they might hear Christ's voice today through His appointed, authorized, living prophets and apostles, whose messages offer much needed guidance to help us strengthen our families and live according to God's will. If they reject what we have to share, we still accept our fellow Christians - and people of good will everywhere - as our brothers and sisters, hoping to work together to strengthen our communities and our families. Our message is about coming unto Christ - not condemning others who don't share our beliefs. We have no need to tear down the houses of other people (using this expression as a symbol). We are perfectly willing that they should live in the homes that they have erected for themselves.... While we will not condemn that which they love and cherish above all other things in the world, we will endeavor to show them a better way and build them a better house, and invite them kindly, in the spirit of Christ, of true Christianity, to enter into a better dwelling." A good online article on this heavy topic is "The Restoration of All Things" by James E. Faust. The fullness of the restored Gospel includes the words of Christ in the Book of Mormon and the Bible, baptism by immersion, the gift of the Holy Ghost by the laying on of hands, modern prophets and apostles, and so forth. A discussion of how these things were lost is provided in useful online articles on the Apostasy in general and on the loss of truth and authority for baptism in particular. A new site of great value in this area is Mormonism and Early Christianity by Barry R. Bickmore. See also Barry's book, Restoring the Ancient Church: Joseph Smith and Early Christianity (Ben Lomand, CA: Foundation for Apologetic Information and Research, 1999, available at Amazon.com). It contains extensive information from early Christian writings that point to the authenticity of the Restoration that occurred through Joseph Smith. In Chinese-speaking parts of the world like Hong Kong, Singapore, Taiwan, and even parts of Toronto, London, and Australia, the Church is known as "耶稣基督后期圣徒教会." In Argentina, Mexico, Peru, and many other Spanish-speaking nations, large congregations of "Mormones" meet as "La Iglesia de Jesucristo de los Santos de los Ultimos Días." In Russia, it's "Церковь Иисуса Христа Святых последних дней." In Germany, it's Die Kirche Jesus Christi der Heiligen der Letzen Tage. In Greece, it's "Το εκκλησία του Ιησού Χριστού των Αγίων των τελευταίων ημερών." But whatever the name, one of the cool things about being a Mormon is that you have brothers and sisters in the Church wherever you go. And the same teachings are provided all over the world. It's a remarkably unified church with a lot of terrific people striving to build a warm, loving community grounded in Christ. Come join us and see for yourself. "Frequently Asked Questions About Latter-day Saint Beliefs". My own unauthorized answers - so beware! DNA and the Book of Mormon - a lengthy treatise by yours truly, with dozens of references that you can check for yourself. Note that the critics are relying on a weak reading of the Book of Mormon in their much publicized attacks on this issue. See also "Questions about Science and Mormon Doctrine" - an April 2004 essay that deals with general issues of science and Mormonism, as well as specifics such as evolution, the Flood, DNA, etc. The Book of Mormon and Metal Plates - powerful modern evidence for the authenticity of the Book of Mormon. LDS Scriptures Online at LDS.org - with the complete text of the Book of Mormon, the Bible, and other LDS scriptures. But if you really want to read the Book of Mormon, get your own free copy by calling 1-877-537-0003 in the U.S. or order a free copy at Mormon.org. LDS.org News - MormonNewsRoom.org provides recent news from the Church, including responses to some attacks in the media. Maxwell Institute, formerly the Foundation for Ancient Research and Mormon Studies in Provo, Utah, is the leading organization for scholarly understanding of LDS issues, especially the scriptures. They are a tremendous source of valuable research and publications. As one of many examples from FARMS, one of the best written articles dealing with typical anti-Mormon attacks is that of Russell C. McGregor and Kerry A. Shirts, "Letters to an Anti-Mormon," FARMS Review of Books, Vol. 11, No. 1, 1999, pp. 90-298 (I said it was good, not short!). FARMS Reviews of Books This publication page offers some of the best resources for intellectually refuting the arguments of many popular anti-Mormon books. Reading anti-Mormon literature gives one the impression that we sheeplike Latter-day Saints are stunned by the powerful arguments against us and that we have never been able to even respond to, much less refute, their attacks, relying solely on hypnotic chanting about testimony and an occasional warm feeling that might just be heartburn from too much green jello. What the critics don't want you to know is that their tired arguments have frequently been refuted for decades, and it is they who fail to respond to the powerful intellectual arguments against them. Don't take my word for it - judge for yourself by reading these FARMS reviews of anti-Mormon writings. They are helpful in understanding the deceitful tactics of some anti-Mormons and in learning the rich extent of evidence in favor of the Restored Gospel. Enjoy! The Mormon Interpreter - Formed in 2011 to maintain the scholarly traditions of FARMS and the Maxwell Institute in defending the faith, the Mormon Interpreter brings together many leading LDS scholars to provide rich insights into the LDS scriptures and to strengthen the faith of those examining LDS religion. Love, Dating, Marriage, and Morality - a new LDSFAQ page answering common questions about dating, marrying in or out of the Church, morality, and so forth. These topics have resulted in many questions recently - often from non-LDS people dating Mormons. I hope this page will help. Gospel Principles - a book published by the Church to teach basics of LDS belief and practice, available free online at the LDS Web site. The Nauvoo Times - multiple LDS authors, led by Oron Scott Card, sharing their views on religion and life. Russell Anderson's Response Page - responding to many of the attacks of anti-Mormon critics. Book of Mormon Witnesses - what historical scholarship really reveals about the reliability of their eyewitness testimonies. American Prophet: The Story of Joseph Smith - the excellent PBS production about the life of Joseph Smith. Dallin Oaks speaks at Chapman University - insights from one of the Twelve Apostles presented at LDS.org. Mormanity - my LDS blog. "Historical or Hysterical -- Anti-Mormons and Documentary Sources" by Matthew B. Brown. This essay is based on a presentation he gave about the abuse of historical sources by anti-Mormons in their attacks on the Joseph Smith story. It includes a number of graphics taken from PowerPoint slides that can be expanded upon clicking to see details. Numerous references are provided for the points Brown makes. Signs of the True Church by Mark E. Petersen. DNA and the Book of Mormon - my page. Encyclopedia of Mormonism - offering basic information on LDS history, perspectives, issues, the arts, etc. The Truth About "The God Makers" - a book by Gilbert W. Scharffs, now available online, deals with a well-known anti-Mormon book point by point. LDS leaders instruct the Church primarily through the semi-annual General Conference. The Official LDS Web Site now offers the complete proceedings of recent General Conferences in many languages. Examples include the October 2012 Conference, April 2012 Conference, and the October 2010 Conference. Mormonism: Overview by the BBC - the Religion and Ethics section of the BBC's Website has a useful section on the Church. It's a good place to see a fair and respectful outside view of The Church of Jesus Christ of Latter-day Saints. Mormon Times (MormonTimes.com) - Daily news about Mormons and Mormon topics brought to you by the Deseret News.